Follow the Romantic Road and follow your heart. On Germany’s most popular scenic drive you will find unspoiled nature, picturesque towns with medieval city walls, half-timbered houses, hidden monasteries, castles, and romantic hotels. By auto or motor bike, this 261 mile long scenic route makes the journey your reward. The Romantic Road leads you from the Franconia wine country in the north to the foothills of the majestic Bavarian Alps in the south. Originally a trade route in the middle ages, it is strongly connected to Germany’s history. For the foodies, a stop along the way for some mouth-watering schnitzel, brats or beer is a must! No trip would be complete without a visit to Wurzburg, the town northernmost on the Romantic Road. Here you will find beautiful architecture, fabulous restaurants, and a great winery in the famed Franken Wine Growing Region. The Marianburg Fortress is located on top of a hill that overlooks the city and is located on the very site that the first church in Germany was built in 706 AD. The oldest part of the resdesigned fortress displays a blue dome which is reportedly from the eleventh century. The Residenz offers up the romanticism of the Baroque age and has a large well and garden that both date back to the year 1631. Rothenburg ob der Tauber is picture-perfect – the best preserved medieval town in Germany. Walk atop the medieval wall that encircles the old city center, or go to the top of the historical Town Hall for a spectacular view of the region. Castle Hotel Colmberg: Spend a romantic night you won’t forget in the 1000 year old Castle. Dinkelsbühl – The Old Town boasts 16 fortified towers, several authentic city gates, and an original ring wall. At night, you can take a tour through the historical town with the night watchman while he goes on patrol in the illuminated city center. Augsburg’s 2000 year old past comes to life in the historical city center with its baroque town houses, splendid boulevards, and traditional German restaurants. Enjoy a genuine medieval candlelight dinner in one of the old vaulted rooms. Pfaffenwinkel is located in the part of Bavaria (called “Pastor’s Corner”) which is famous for its pilgrimage churches and pristine landscapes. The Wieskirche (“Church in the Meadow”) in Steingaden is a rococo masterpiece and is on the list of the UNESCO World Heritage sights. 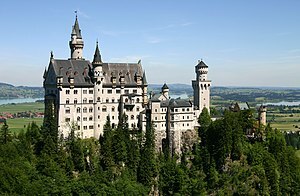 Neuschwanstein – The fairy tale castle we all know and love which inspired Walt Disney is nestled in the Bavarian Alps and encompasses the very notion of romanticism. You can reach the castle by hiking on foot or taking a lovely horse and carriage ride to the top. The Romantic Road is the most popular German scenic drive and can get very crowded in the Summer season.